Question: Do More Expensive Bats Increase Bat & Ball Exit Speeds? 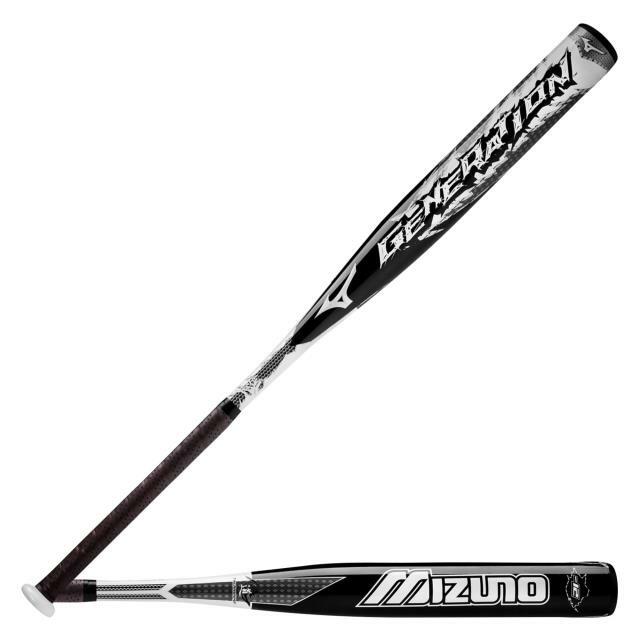 Mizuno Generation ($70-200 on Amazon). Balance – (lighter swing weight, which can result in faster bat speeds). Another factor in this baseball batting practice Mizuno bat model experiment will be breaking in a non-wood bat. CLICK HERE for a good YouTube video on how to break-in a composite bat. Now, both Mizuno bats are not composites, but I’m sure the breaking in process with any non-wood, will have an affect on Ball Exit Speeds. We’ll adjust the data to address breaking in the bat in the Notes section. 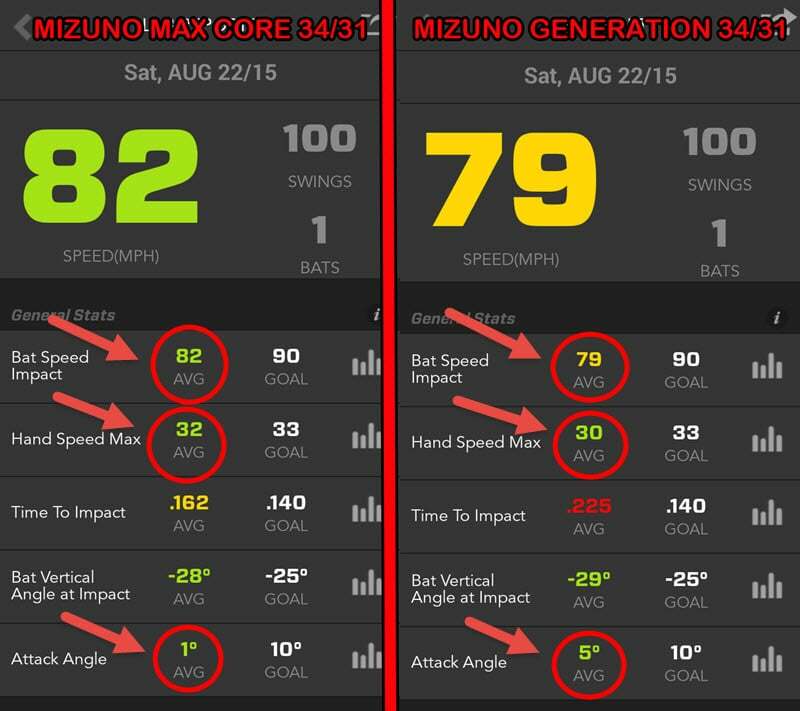 Based on the above baseball batting practice Background Research from Mizuno (albeit promotional materials), and the fact the MaxCor is double the price, I’d expect a much better performance in Bat and Ball Exit Speeds using the MaxCor model bat versus the Generation. 34/31 Mizuno MaxCore BBCOR bat. All baseball batting practice swings were taken off the tee. CLICK HERE for the Google Drive excel document with all the Ball Exit Speed (BES) readings. We deleted radar gun mis-reads that registered below 30-mph on the gun. Therefore, we deleted 11 mis-reads from the Mizuno MaxCor bat data, and averaged all MaxCor BES readings to 89 swings. Also, we deleted 7 mis-reads from the Mizuno Generation bat data, and averaged all Generation BES readings to 93 swings. “Mizuno Generation” were letter ‘B’. 200 total swings were completed in the experiment, 100 per test. Counter-balancing helps remove the “getting tired” and “not being warmed” up factors. Avg. Attack Angle decreased by 4-degrees using the Mizuno MaxCor. Top out Ball Exit Speed was 90-mph using the Mizuno MaxCor bat. Now, we can’t compare apples to apples baseball batting practice data using the Zepp app and Bushnell radar gun. If I had one more Bushnell radar gun capturing my bat speed readings perpendicular to my chest, then that would’ve been an interesting comparison. I felt much more balance with the Mizuno Generation. I also felt like I was more consistently hitting the sweet spot, as their marketing suggests. For some reason it was tough feeling a consistent sweet spot using the MaxCor, maybe because of the “Dynamic Damper: Transition piece from barrel to handle absorbs vibration for better feel”. 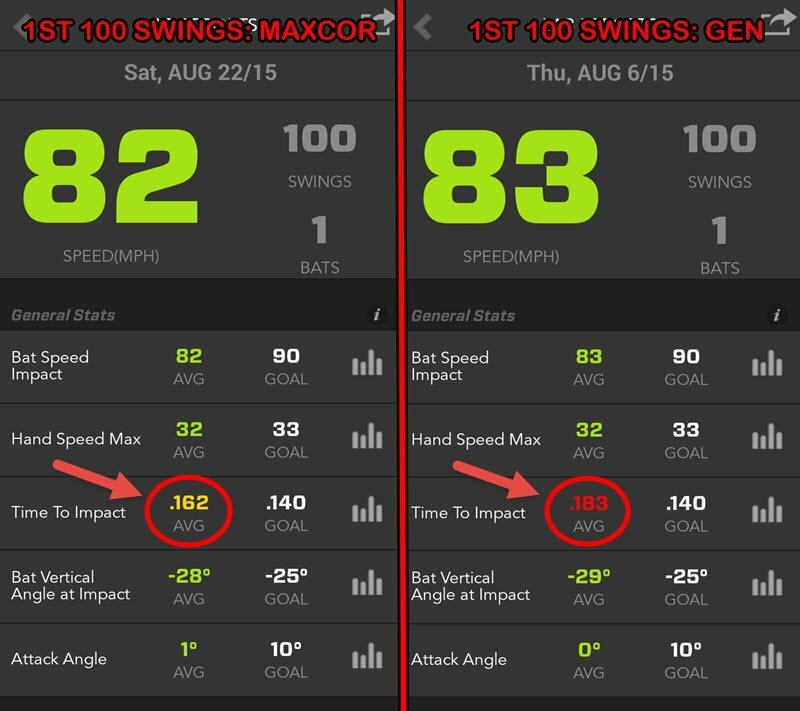 How about comparing the Ball Exit Speeds of the first 100 swings…according to this Google spreadsheet, the Mizuno MaxCor Avg. Ball Exit Speed was: 83.5-mph. And according to this Google spreadsheet from a couple weeks before, Avg. Ball Exit Speed using the Mizuno Generation 34/31 was: 88.3-mph. Well, according to the baseball batting practice Mizuno bat model experiment data, it looks like the Generation model holds the performance edge when it comes to Ball Exit Speed, almost a 5-mph difference. That’s about 20-feet of extra distance! From how the experiment turned out, I’d save the $200 and buy a Mizuno Generation. Now, this data doesn’t mean EVERY expensive bat will under-perform it’s more economic brethren, it just means you need to tinker and test to find the truth. "Bunt" Your Way To Repeatable Power? Great info!! Keep up the good work Joey! You said ( The maxcore was greater in all areas but attack angle) … I think attack angle is the sum of all parts of your swing and is generated by you and not the bat. As attack angle gets lower hand speed and bat speed tend to be higher. This is because the bat is shorter to the baseball and has not started its upward ascent. Aka you swung more level and a level swing will yield greater speed results than a swing with a lifted attack angle. Attack angle is generated by not swinging up but where the ball is struck in relationship to your front foot, where the tee is placed, and if your barrel stays above your hands in relationship to vertical angle of the swing. Of course I’m a dork and way to into hitting and I realize I could be wrong period. Jeremy, I appreciate your analysis, and it is quite insightful…giving me some different things to think about. Thank YOU. However, this experiment was compromised because of the different MOI’s of the bats. I didn’t take that into account. Ideally, for the experiment to work, both bats had to be the same size and weight, and the same balance (MOI). What was interesting though, that you forgot to mention was the almost 5-mph increase in Ball Exit Speed using the Mizuno Gen bat, and the top out bat speed difference. All that being said, I would have to do this experiment over using the same MOI bats.